At Footprint Digital, two of our key values are that we believe that there’s nothing people can’t achieve, and that we embrace challenges. 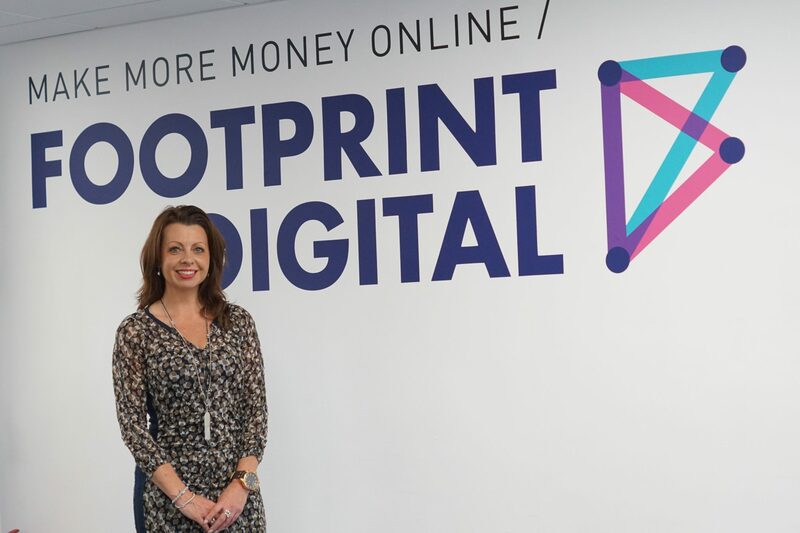 Our latest Think with Footprint speaker is the epitome of these two things, and we were extremely pleased to welcome her into our offices on Friday 13th October, to hear about her life as a Performance Coach for businesses. Liz Flavell started off her career at a Surveyors in her mid-teens (when most of us are still watching far too much daytime telly and putting off thinking about the future), working her way up for seven years. After this, she moved into business development, often ending up being the only woman in the room, in a male dominated industry. She used this to her advantage, as being the only woman meant everyone knew who she was. Whilst working in business development she was headhunted (several times) by a recruitment agency to work for them as a Recruitment Consultant, where she often put in 15-hour days and became the company’s top biller. She joined another company in Mayfair, and became a director within 7 months. Then the recession hit. Whilst for many people, this was an extremely worrying and negative time career-wise, Liz took it in her stride, and decided to take redundancy from her job in Mayfair, and volunteer at Colchester General Hospital, helping patients and their families through some of the toughest times in their lives. She said that this experience was where she learnt the most about communicating with people. 6 months later, she was back in business, working once again in business development at a new recruitment company. By this point, she found that many businesses were reaching out to her, asking for help with their own development, so in order to be able to help them all, she founded her own business in Performance Coaching for recruitment agencies. As a Performance Coach, she goes into faltering companies to act as another set of eyes, fitting in with the staff members and acting as a bridge between them and their management to try to resolve problems and get the wheels back onto the business. Two of the key reasons for being brought into a company, Liz said, are because lines of communication have broken down, or because staff are not praised for what they do. (The main reason is actually because profits are down, but often the underlying issues are communication and praise). Usually, business owners have the best of intentions when they ask staff to do things, but they don’t know how to communicate this to them. They tell people to do things, and when they’re not done they tell them again. Then when it’s not done right, they get angry. The problem is not with the staff member, it’s with the communication. It’s a hard one, because most people think they are communicating when they’re talking at somebody – but real communication is much more intricate than that. Einstein defined insanity as doing the same thing over and over again and expecting different results – this is exactly the problem with poor communication methods. Problems with communication mean that whilst staff may work extremely hard, they are not able to work smart. If you couple this with a lack of praise (or even a toxic culture of blame) then they can’t work hard or smart. If somebody is not praised for good work and made to feel valued, then there is little incentive for them to continue and they may be tempted to slip into doing the bare minimum. Often, Liz’s job starts with just sitting with staff members, finding out about their jobs and listening to them, letting them tell her what their directors are never around to hear (or what they hear, but don’t listen to). An important insight that Liz has for all businesses is that they need to bring the right people in at the right time, because we can’t all be good at everything – and we shouldn’t try to be. If an employee is employed to do one job, they shouldn’t be expected to do another. Equally, a director or CEO should not feel as though they must do everything – we are not superhuman. Asking for help, and employing people to take the weight off is not a sign of weakness or inability, it’s a sign of being strategic – recognising when support is needed and getting it before the business suffers. 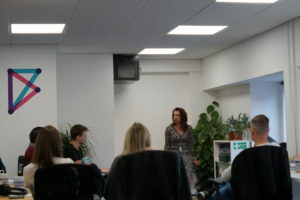 Liz’s talk left us feeling incredibly motivated and inspired (I reckon she’s got that Performance Coaching thing down!) Her sheer hard work, open and honest approach, and empathy make her a real business role model. Thanks Liz, for a hugely insightful talk! By Alexandra Eade, Content Manager.